The chronological discography for Aristocrat Records – precursor of the famed Chess Records – is a tangled mess designed to frustrate and annoy those who want some clarity on the releases of its roster of notable artists. In many ways their incomprehensible numbering system in which each act got their own “line” of a hundred spots (the 100 series for the immortal Sherman Hayes, the 200 sequence for The Five Blazes, the 300’s to house all of the output of George Davis’s Quintet… which consisted of all of two failed singles before he was dropped), was symbolic of the company’s lack of experience in the record business. 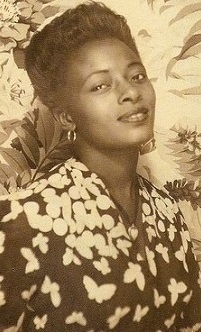 Started by Evelyn Aron as something of a lark she nevertheless built up quite an impressive array of talent drawn from the Chicago club scene that put her company in good stead as the black music scene was growing exponentially in the late 1940’s. Yet of all of the artists who had releases on Aristocrat it wasn’t the future blues kingpin Muddy Waters or the acclaimed jazz saxophonist turned rocker in Tom Archia who had the most potential to be a superstar. Nope, it was Andrew Tibbs, the good looking kid with the shy self-effacing manner, the one with the dynamic gospel-shaded voice who scored the label’s first hits as a versatile rock artist before he was old enough to buy a drink and whose career was incomprehensibly winding down just as the label he helped to establish was poised to take off. Piecing together what records Aristocrat was releasing concurrent with #1106 in the summer of 1949 is a little maddening, but sandwiched in between a Waters blues offering and a Gatemouth Moore gospel record was Andrew Tibbs who once again saw Aristocrat unable to even get the artist credits right, attributing this to him accompanied by The Dozier Boys, the vocal group which had sung with him last time out but who are uninvolved with this recording. 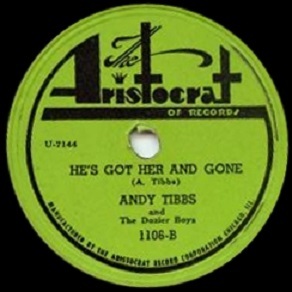 It’s not the first time Aristocrat has messed up in this area, something which contributed to a sense of confusion regarding Tibbs, not only being forced to share label credit with mere backing singers but also having his name changed to Andy Tibbs to further confuse buyers. On top of it all the Aristocrat label itself had just switched from white with red accents to a greenish yellow with black print, so if you were the kind who merely scanned labels in a store looking for something familiar you were out of luck. Making matters worse is the fact that Tibbs hasn’t had a release since last December when In A Traveling Mood – though not a hit – was his most impressive performance to date. It’s doubtful that they waiting seven months to issue a follow-up in the mere hope that “Traveling Mood” might start to take off. Since they had sides already cut and ready to go, including this one, the interminable wait further derailed his chances for those who HAD bought each Tibbs release and were anxious to hear more. Audience turnover in this brand of music was shaping up to be a lot more rapid than was found in jazz, blues or gospel where older fans reigned and would be loyal to artists for a decade or more. By contrast rock ‘n’ roll was the realm of younger listeners whose interests, like their lives in general, progressed rather quickly. From leaving school to entering the workforce, from being single and on the prowl for dates to being in longer term relationships, from having little or no responsibilities to taking on the burdens of job, house and family, that was the swift transition from teenager to adult, especially in this era when few from African-American communities got to prolong their adolescence by going to college. Tibbs was emblematic of that abrupt maturation process himself. Just eighteen when he first stepped into a studio back in the waning days of summer 1947 to cut his first record as an inexperienced hopeful novice, he was now twenty years old and an established professional with hits under his belt and seemingly on the verge of a long career as a star who might shape the future of rock in ways nobody might’ve fathomed. Instead it all came crashing down. But if He’s Got Her And Gone is any indication, the blame can’t be placed on the records because Tibbs once again proves he’s as good as any singer rock has seen to date and for once he’s got a supporting cast who may be up to matching him. Though he’s had big names behind him in the past, including the same group as is featured here, this stands as the backing which is most simpatico with what Tibbs himself is laying down. Sax Mallard’s group is totally in sync with Tibbs throughout He’s Got Her And Gone, which gives the entire record a vibrancy that is infectious. It kicks off with a strong bass pattern played by the piano and a deliberate horn refrain that is capped off by Mallard’s drawn out moan on sax that appears out of the blue. Already you’re squarely in the groove as Tibbs makes his entrance, his supple tenor voice cutting through the speakers loud and impassioned but fully under control. Again it’s necessary to state just how great of a singer Andrew Tibbs is. Not only does he have a voice that puts most of his rivals to shame but his control is so startlingly good that it makes comparing others to him almost unfair. He has the ability to draw out lines for maximum impact, as he does here on the lead-in, as well as being able to ramp up the intensity to convey the emotional qualities the songs require and can effortlessly pull back for dramatic effect moments later. His arsenal of vocal techniques is unmatched in rock to date and he rarely chooses wrong when it comes to which weapon to draw. You might rightly claim that Roy Brown is more dynamic and emotional at his best and certainly Jimmy Ricks voice is more distinctive and colorful, even Wynonie Harris has his loyalists who point to his full-barreled revelry as perfectly embodying the type of in your face directness rock music thrives on, but there’s nobody who can match Tibbs when it comes to expressiveness or purity of voice. 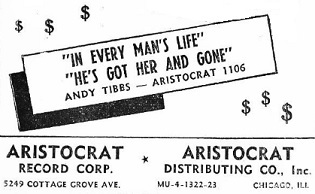 Which brings us to another facet of Tibbs’ artistry, his songwriting ability, as He’s Got Her And Gone is yet another example of him crafting a story that on its surface is rather basic – him boasting about a girl who’s in love with him – but he frames it in such a way that gives far more depth to the story. A juicy story it is too, one bordering on the salacious yet presented with a hint of youthful naivety which lets Tibbs off the hook just enough to keep him endearing. It seems the girl in question is married to another guy and each morning when that fella heads off to work she races over to see the one she’s crazy about, our friend Andrew, who “gives her plenty of lovin’, that’s what she really needs”. There’s nothing underhanded about this he insists – though feel free to dispute that on ethical grounds – simply because everybody in town knows about this affair. He states very bluntly that she’s with him all of the time and in a line that can be read two ways, though one interpretation leads quite naturally to the explanation regarding the other, he claims, “She comes so doggone often, everybody thinks she’s mine!”. Hmm. If that’s indeed the case, who can blame her for being so attached to young Mr. Tibbs. While the husband in question may be the only one unaware of his wife’s infidelities, the band certainly are up to date on all of the juicy gossip, not to mention up to date musically which gives He’s Got Her And Gone an added kick. Though the tempo never gets beyond mid-paced and the horn section is comprised of a few too many higher register trumpets and altos, the playing is streamlined and constantly surging which gives it a momentum that is hard to resist. There’s multiple solos to sink your teeth into as well. Before we even get to the first one there’s a moment where all of the instruments but one drops out as Tibbs delivers a stop-time recitation backed only by the stand-up bass which adds a nice element of tension as he sets the scene for his boastful declarations which follow. When the piano takes over in the first break it’s played with a unique choppy rhythm, reputedly Sun Ra which makes sense listening to it if you’re aware of his reputation, as he plays with a quirky sense of time yet doesn’t detract from the drive of the track. Mallard’s solo which comes after another vocal refrain starts off slow, almost timid in both its tone and its pacing, then even drops down to hint at something more mysterious going on behind closed doors before throwing those doors open to bring us to the… umm… climax as it were. The band apparently were peeping in the windows during all of this because following that musical culmination they start chanting “He’s got her and gone” like a bunch of tattletales who can’t help but announce the salacious news to passer-bys. Tibbs isn’t above crowing about his conquest either, though not from a position of insecurity but rather one of well-earned self-assurance as he responds to each of their announcements with chest-pounding statements asserting his prowess in simple primal terms. Hardly honorable maybe, but entirely understandable when looked at from the perspective of a kid who just two short years earlier – one year in fact when you consider this was cut back in November of ’48 – was a wet-behind-the-ears novice and now he was sitting on top of the world, possessor of a national hit and more than incidental local acclaim around The Windy City. The Man That Can Succeed…? Though not quite on par with his previous release from the same session, In A Traveling Mood, this isn’t that far off from that high standard and shows that far from being a kid lucky enough to catch lightning in a bottle as he hit with I Feel Like Crying and even earlier vocally with Union Man Blues, Tibbs was shaping up to be a vital force in rock who was capable of releasing records of consistent high quality. If you want to throw shade at Aristocrat Records for not being able to properly promote and/or distribute these to further his career, feel free to do so, because clearly they need to shoulder some of the blame for these not finding a bigger audience. In terms of style these were perfectly aligned with a dominant thread of emotionally-laden records by Roy Brown and Amos Milburn which were tearing up the charts as we speak. Tibbs’s vocal attributes drew from both of those men but were delivered with an even more expressive tone and defter touch. Now add in the fact that his home-base of Chicago was the second biggest city in America at the time and had a much more concentrated supply of potential customers within the larger region that covered the mid-west territory from Detroit to Cleveland to St. Louis, so if there were any rock fans within that area who were not fully aware of Andrew Tibbs during this stretch then that falls on Aristocrat. But then again there are times when the public just misses somebody who is well worth the effort to hear and there’s really no explanation for it. Tibbs might’ve been the first “can’t miss kid” who missed but he wouldn’t be the last. If you were twenty years old in the summer of 1949 there were a lot of things on your mind. The usual personal issues of finding a job to make money and finding ways to spend that money and finding someone to spend it on. Then there were the big picture issues related to navigating a world hostile to you based on nothing more than skin pigmentation, knowing full well you’d never get the opportunities that should rightly be afforded you. There were baseball pennant races to follow, in both the American League with the Yankees and Red Sox battling it out and the National League where the Dodgers and Cardinals would come down to the wire. There was plenty of action in movie theaters if you wanted to get out of the steamy heat outdoors and wile away your days in a darkened theater watching John Wayne in She Wore A Yellow Ribbon or Kirk Douglas lacing up boxing gloves in The Champion. If you wanted to laugh there was always Martin and Lewis to watch run roughshod in My Friend Irma. If you were lacking the funds for a ticket you didn’t even have to leave the house for your entertainment if you had a television set installed, as more and more people did by the day, and there was always radio to keep an ear glued to, even if few stations played the kind of music you preferred. So all things considered missing out on one record probably didn’t seem like the end of the world. But for Andrew Tibbs it proved to be the first step towards the end of his world in the professional sense. No longer an up and comer on the rise, from now on he was fast becoming a has-been on the decline commercially. Yet as He’s Got Her And Gone shows, he still might have been the best singer there was, the ideal rock star in every way, and so in that sense maybe the buck you – or looking back from 2018 more likely your grandparents – spent at the movies that July a long time ago would’ve been better spent searching through the bins at the record store for Aristocrat 1106 in the hopes that Andrew Tibbs eventual slide into irrelevancy might’ve been staved off awhile longer. Leave a reply on "Andrew Tibbs: “He’s Got Her And Gone”"